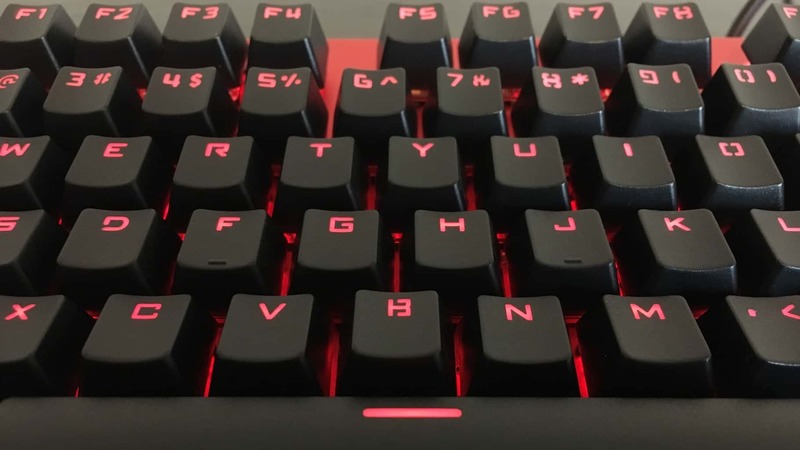 Though it’s on the high end of the budget category, the ET Robot E-Sports Mechanical Keyboard is just about the nicest looking and nicest feeling model we’ve reviewed at this price point. Stupendous, sturdy build quality, with Blue MX switches and a solid aluminium frame. 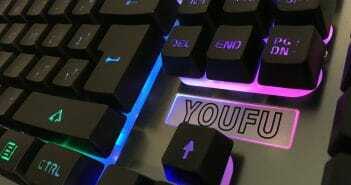 Incredibly attractive keyboard with an absurd number of lighting effects. 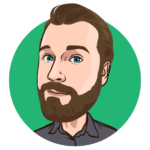 Mostly lacking in premium features outside of Windows lock and anti-ghosting. Pricey for a budget keyboard, but the quality on display is more than enough to justify it. 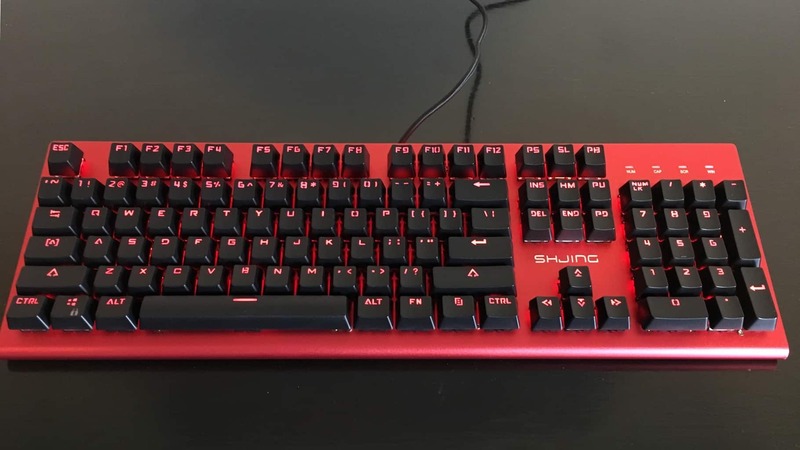 We’re just about ready to wrap up our series of reviews on budget-priced gaming keyboards. Over the past several weeks we’ve looked at a number of gaming keyboards priced at $50 or less, each with varying degrees of value for the price. Today we’re back up to the high end of the price range with the ET Robot E-Sports Mechanical Keyboard. Priced at just under $50, it’s definitely one of more expensive models we’ve looked at, but is the quality substantially high enough to justify it? Let’s find out. Right out of the box, the ET Robot E-Sports rig is probably the nicest looking and feeling keyboard of any of the models we’ve reviewed. I’ll get to the aesthetics later on in the review, but for now, let’s focus on build quality. The internal guts of the keyboard are housed in a translucent white plastic body that is illuminated by red LED backlights, and then the whole thing is wrapped inside a solid aluminum frame. This isn’t a thin, flimsy faceplate like we saw on the YouFu keyboard, instead this is something solid and sturdy, somewhat reminiscent of Apple’s design sensibilities. That’s not to say this is exactly like an Apple product – it’s not a unibody design like Apple is known for, and it has standard sized keys that are more comfortable to type on than Apple’s thin, low profile design – but the aluminum frame gives it a somewhat similar look and feel. Beyond the actual body, the keyboard sports Blue MX switches. Not Cherry Blue, mind you, but a custom design with a comparable feel (for what it’s worth, the product description on the Amazon listing claims that they’re made by the same manufacturer as Cherry Blue switches despite the fact that they’re not name brand). The switches feel appropriately nice to type on with the satisfying click that characterizes Blue mechanical switches. 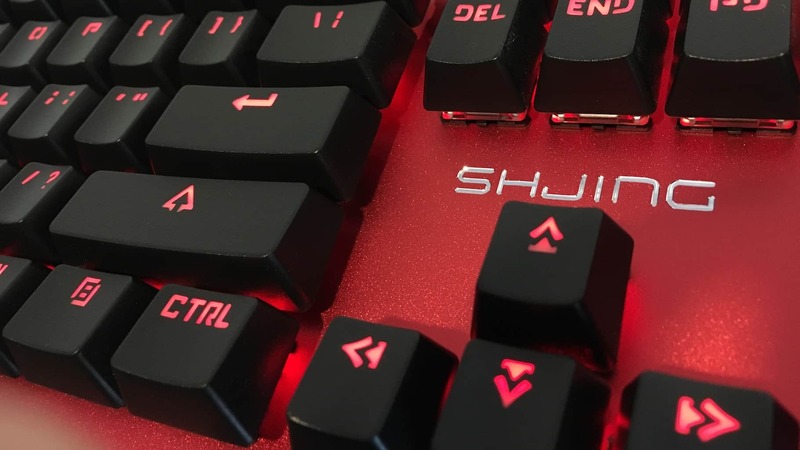 Rounding out the surprisingly solid construction segment of this review, it’s worth noting that the ET Robot E-Sports keyboard is the only one we’ve reviewed that has a braided USB cable rather than the standard rubber housing. It’s a small detail, but it’s one more thing that makes this feel like a higher end product than the price point would suggest. 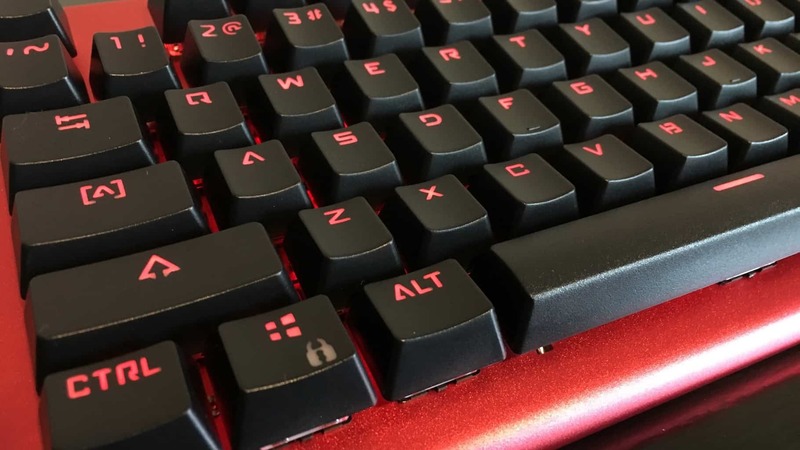 Like nearly all of the keyboards we’ve reviewed in this category, the ET Robot E-Sports keyboard is a fairly feature-lite affair. It doesn’t come with customizable macro keys or dedicated media playback buttons. It does have anti-ghosting features (which, from my testing seems to be a full n-key rollover, though the product description doesn’t confirm that). 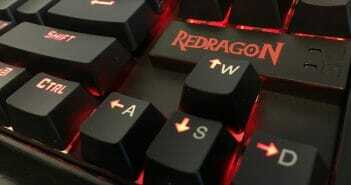 In terms of its feature set, it’s nearly identical to both the EagleTec and Redragon models we’ve reviewed while being less feature-rich than the Corsair model and more feature-rich than the YouFu. The only minor difference between this and the EagleTec and Redragon models is that, although it does have media playback controls via the Function keys, the keys are not labelled with those controls, meaning if you’re reliant on these features you’ll have to either have the user’s manual handy or take time to memorize which function corresponds to each key. Your mileage may vary here, but of the five keyboards we’ve reviewed thus far, I think, aesthetically, the ET Robot E-Sports keyboard is the nicest looking design by a pretty wide margin. The solid aluminum frame with soft, rounded edges gives it a sleek, elegant look that really makes it feel like a high end product. Just from the perspective of personal taste, I’m not in love with the red coloring on the aluminium, but it’s worth noting that a version also exists with a black finish, though it is currently unavailable on Amazon.com. Another nice aesthetic touch is the way the aluminum frame is left open on the back and sides of the keyboard allowing the red backlight to spill out, creating an eye-catching glow that surrounds the keyboard in low light conditions. The backlight itself is clear and vibrant; it’s only a single color, red, but ET Robot compensates by having an absurd number of lighting effects available. There’s all the standard fare – waves, breathing, solid – and then there’s a whole host of other unique lighting modes to choose from. There’s a mode where the backlight pulses out in ripples from each key press, where the backlight streaks through each row of keys building up to the top, and more. There are, in total, 24 different lighting modes in addition to settings to adjust brightness and speed settings. Ultimately, these are little more than gimmicky bonus features, but they’re a lot of fun to play around with, and there’s more room for customizability than any other keyboard we’ve reviewed at this price point. 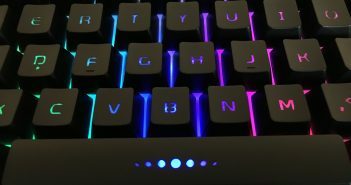 The ET Robot E-Sports Mechanical Keyboard is at the very high end of the “budget” price point, but it earns its place there by packing mechanical switches and an abundance of lighting profiles into an attractive, sturdy design. In terms of pure bang-for-your-buck, I’m not sure this can top the EagleTec model, but if you’re willing to splurge a bit for some extra features, this is one hell of a keyboard for the price. I’m from Australia and since amazon usa doesn’t ship to Australia anymore where can I purchase the ET robot keyboard and mouse, pls advice thanks. but perhaps there are cheaper ones. I grabbed this board on Amazon a couple days ago, just received it, and grabbed the software from their website that their Amazon product page claims allows you to customize the backlight functionality. Problem is, the software (a single executable), crashed immediately upon execution, with a “abnormal program termination” error. Did you guys have any of these kinds of issues? 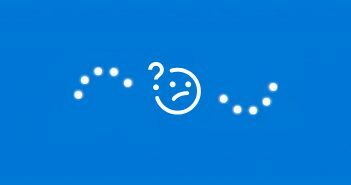 Any ideas on a remedy? 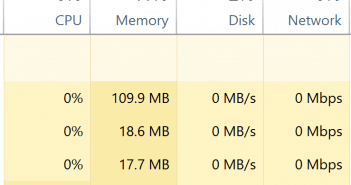 Go for the x64 if you’re running an 64-bit Windows 10 and for the x86 version if you’re running a 32-bit one. After installing it, give your computer a restart and try to install the program again. Please come back and tell me the results and I’ll do my best to help you further. Good luck!